Recently, Gerald Heller an I discussed about metrics used in agile development, agile testing metrics in particular. We found quite a number of relevant metrics and sought a way to structure them. Partly inspired by Brian Marick’s testing quadrants (see Lisa Crispin’s presentation), we ended up with a matrix spanned by two dichotomous axes. The first axis (horizontal axis) distinguishes between coordinative and analytical metrics usage. Coordinative metrics are well-suited to directly support project activities, information needs, and decisions. Examples are tracking of work item status or burndown. Analytical metrics are used as input to investigations and analyses as they are conducted, for instance, in iteration retrospectives. An example is story cycle time, which shall be investigated at the end of a release in order to look for improvement opportunities for subsequent releases. The second axis (vertical axis) distinguishes between internal and external metrics target groups. Internal target groups are the members of an agile software development team. External target groups are other stakeholders such as development management and product management. The following figure shows our proposed agile metrics grid along with a number of categorized agile metrics. 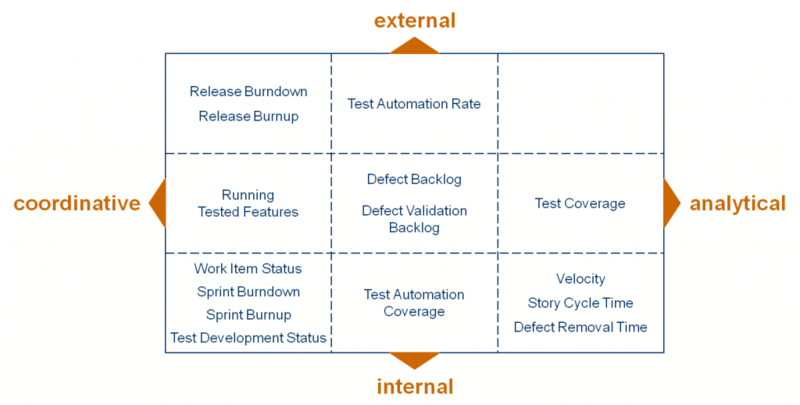 The grid helps guiding metric definition and clarifying the role that a given metric plays for agile development. The agile testing grid is described in more detail in issue 4 of Agile Record, a magazine for agile developers and agile testers.